Due to the numerous innovative orthodontic solutions available, metal braces may become a thing of the past for many types of patients: One such solution is the SimpliClear® wire braces system. With programmable wires, this state-of-the-art system applies a gentle force to adjust the teeth. In addition, the SimpliClear® system is typically more comfortable than the traditional metal braces are; furthermore, treatment time may be reduced. SimpliClear® is made of a clear, polymer composite wire. This unprecedented clear wire system is used in conjunction with clear brackets; thus, allowing individuals to straighten their teeth, inconspicuously. Additionally, the combination of clear brackets and wires allows individuals who have metal allergies to straighten their teeth without worrying about an allergic reaction. Every set of braces consists of two parts, the brackets and the wires. The brackets are placed on the teeth and the wire connects the brackets: The wire is the key to moving the teeth. When Dr. DeDomenico determines the time has come to move a patient’s teeth, he adjusts the wires. The SimpliClear® wires apply a gentle force to the teeth that need to move. Every smile is unique, which is why Dr. DeDomenico creates each of his patients a customized treatment plan. SimpliClear® braces can be custom-designed to meet the needs of each patient; therefore, this orthodontic solution works as well, or better than traditional metal braces. The ability to move specific teeth at certain times ensures that each patient is able to make the most of their time spent wearing braces. 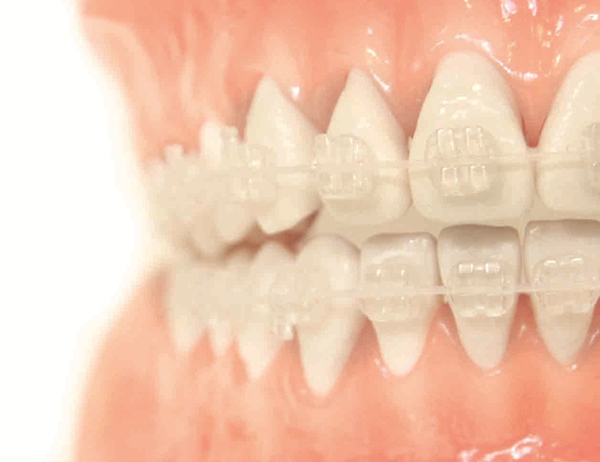 The absence of metal wires means that patients will not feel as if they have continuous pressure on their teeth; therefore, SimpliClear® braces are much more comfortable than traditional metal braces. Contact us today to make an appointment or to learn about the innovative products and treatments available at DeDomenico Orthodontics.